This is a film that I associate with Christmas. It's not the warm and fuzzy type of Christmas movie you would normally expect. While I enjoy those types of films, and will be reviewing some of the classic ones as we near the holiday, I prefer the more unusual Christmas movies, the ones which explore the human condition more than the tinsel on the tree. 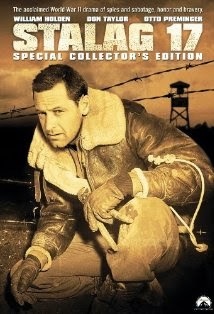 In this film the entire story takes place around the time of the holidays, only this time in a German POW Camp, Stalag 17. The time is less than 2 weeks before Christmas of 1944. In this 1953 film directed by Billy Wilder, fellow Director Otto Preminger plays Commandant Klink of Stalag 17, a POW Camp located somewhere in Germany. He is pure Nazi, right to the bone. They couldn't have picked a better actor. The film is based entirely upon the Broadway play of the same name, in which Robert Strauss and Harvey Lembeck, who play the roles of Harry Shapiro and "Animal", appeared. They are both excellent in this screen adaptation. Someone in the barracks at Stalag 17 is a stoolie. Several men have already died attempting escapes. No one knows who it is, but everyone suspects it to be Sgt. Sefton, played by William Holden, a shrewd black market trader who has fresh eggs for breakfast while his fellow prisoners subsist on gruel. He is not very well liked. He flouts his wealth, mocking the others as "saps." Overseeing the entire barracks is Sgt. Schultz, (if you're thinking of "Hogan's Hero's", forget it. In this film, Klink and Schultz are both real Nazi's, with no shred of honor, or humor. This is a drama.) He is a cruel and calculating man who masquerades as the men's "friend", but his real purposes are sinister and without merit. When the men in the barracks gang up on Sefton, and beat him, thinking he is the stoolie, they set off a chain of events which leads to the discovery of the real mole, on Christmas Eve, just in time for a planned escape by several of the prisoners. With the holiday only hours away, someone is about to pay for those who have died, while others are on their way to freedom. A real surprise twist at the end makes this an excellent film at any time of the year. But now, as Christmas approaches, the film is somehow more poignant, as we watch these men struggle with their burdens, each one bearing their individual cross, during a time of year which normally holds joy for most.